To watch a dancer pass down the details of a signature role, gesture to gesture, body to body can be like watching the flow of electricity. Or an excessively polite family squabble, “On the diagonal? Really? ?” It can be generous and at the same time carry the faintest sheen of regret. It is never dull. Peter Boal, Pacific Northwest Ballet’s far-seeing artistic director, has been very, very good about coaxing formidable veterans of New York City Ballet to Seattle to coach PNB’s rising tide of dancers in “their” roles. And about letting the public in on at least one of these afternoons, as history and memory collide. The sessions that hooked me, permanently, came last year, for a PNB staging of Balanchine’s Jewels. Over the course of a month, Boal lured Violette Verdy and Mimi Paul for Emeralds; Edward Villella with Rubies, and for Diamonds, the irrepressible Jacques d’Amboise, who worked in the plaid shirt and hiking boots he wore the next day on the trails of Mt. Rainier. Utterly different styles, same knock-out effect. Of course these dancers would help pass the torch. Peter Boal is one of their own, a full-on NYCB creation. He’d entered the School of American Ballet at the age of 9; he retired after a 22-year career in the company. As one of their Principals, Boal was both a supreme classicist, known for his “transcendent” Apollo, and a dancer with an intriguing experimental side. He was also a deeply gifted teacher. To imagine him shaping his own company? Heaven. After Balanchine’s death in 1983, when it fell to Robbins to coach a new Prodigal, he picked the young (and even younger-looking) Peter Boal, as his headstrong innocent. Now, with Prodigal Son on PNB’s 2015-16 opening program, it was Boal’s turn, in a mirrored classroom, with a small audience, to tutor two Sons and two Sirens. And also to revisit, dryly, some of the heart attack moments from the Jerry and Peter show, all those decades ago. In the pause that followed, Boal picked honesty as the best route around a non-sequitor. Robbins’ eyes swept the heavens. This was going to be worse than he’d imagined. Much much worse. Okay. That was Robbins’ approach: dancers as actors (and not incidentally athletes), directors as Intimidators in Chief. A prickly approach, but one that worked for him from ballet to Broadway and back to ballet again. Not Boal’s style. In soft shoes, soft pants and a T shirt, he works quietly, giving a reason as he corrects. The Prodigal passes a large wine jug to one of his two friends. “He just bought it, it’s heavy,” Boal says. Now it is, so full it almost sloshes. He changes the angle of the Son’s face just slightly; now it shows his father – not his friends – that he’s leaving. One of the Sirens enters, at the mercy of her yards-long red plush train. “I’m not an expert on Sirens,” Boal says, “but. . . “ he had been able to watch an 8-hour tape from WNET of Balanchine working on Prodigal with Baryshnikov. “They began in English, then quickly switched to Russian, which I don’t speak, but it was. ..” He shakes his head at the memory. In any case, as he works with one Son and one Siren, and she buries his face in her chest, Boal fixes the boy’s expression to show the audience that this gesture was not the Son’s idea. He moves along to the overwhelming ending, although the tall dancer playing The Father hasn’t been called for this session. Boal fills in. “I could never play the Father, “ he says, sotto voce, “I’m too short ” Still, what crosses his face as he sees his destitute, humbled, grief-wracked Son, is everything we need to know about forgiveness, majesty and wisdom. And Peter Boal. 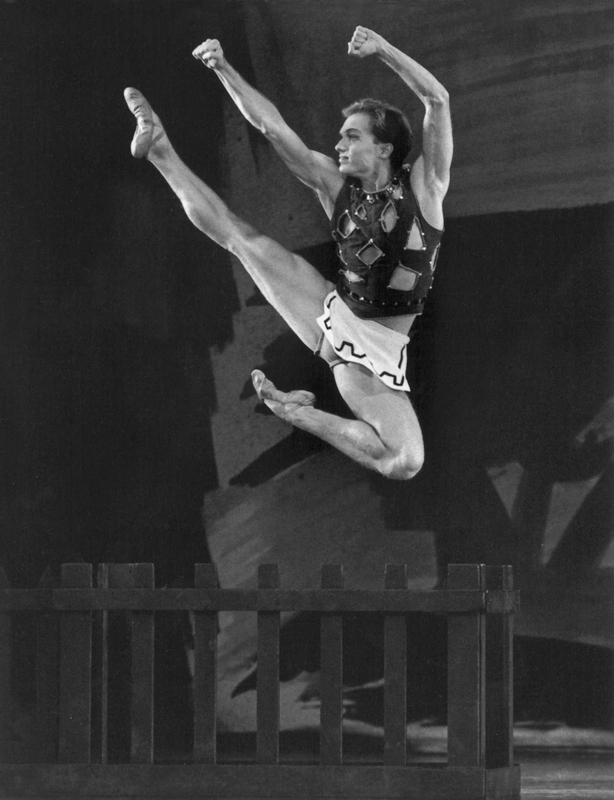 Peter Boal in 1970s Prodigal Son, choreographed by George Balanchine © The George Balanchine Trust. Photo © Paul Kolnik.